Shame on me that I have not yet shared the most popular indian recipe till date...I make them often but opt for ready made packs most of the times. Gits has always worked for me. In the past I also tried some home made recipes using milk powder and maida, which worked as well. However the one I plan to share today was liked by all. 2) In a large basin, mix the maida and khoya and rub it well together. 7) In another pan heat oil for deep frying the gulab jamuns. Add the jamun, a few at a time. Fry till they have light golden color. 8) Remove them. Then drop them in warm syrup. Let it soak for 30 min minimum. Serve hot or cold. Goes well with vanilla icecream, rabdi. Juicy and very spongy jamuns, would love to have a bowl. Put this way, it doesn't sound scary..but otherwise making jamuns from scratch sounds tedious ( esp. When you have so many ready made packs to choose from!).. The gulab jamun looks perfectly done - golden, shiny and mouth watering!! wow yummy gulab jamun I am feeling very very hungry need a bowl plz. Perfect rounds of gulab jamun. Who can resist this delicious sweet?? looks perfectly done and so I want one very badly! Tempting & u have made them perfectly !! Looks so stunning Pradnya, so nice..wish you had got these for us man! my all time fave Indian dessert. love these!!! Such a tempting treat. 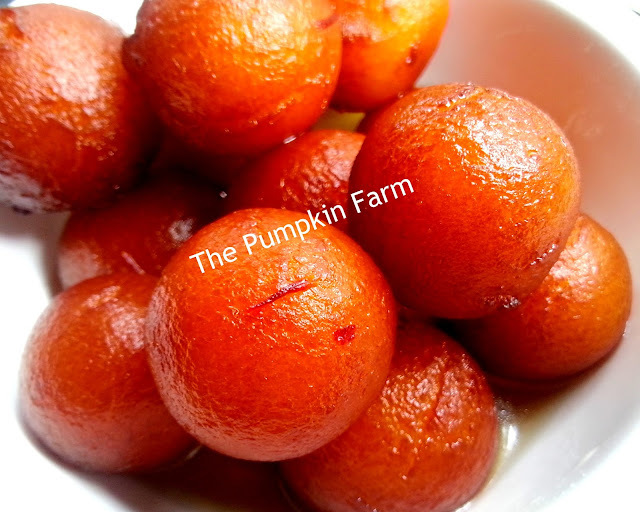 Your gulab jamuns have come out just perfect -- perfectly round and perfectly juicy. Will try your recipe soon. Beautifully made. I have never tried the mawa ones ever. Bookmarking it. Gulab Jamun look so fluffy and delicious. Yummy jamuns..Can never resist them..
Gulab jamuns are my ever favorute desert! Making them from scratch surely makes a big difference in taste..